A modified call for proposals that’s designed to capture their unique perspectives, experiences, and ideas! In what ways do Black Girls contribute to their own well-being and the well-being of those around them? How are they or how are they not recognized for the contributions they make? How should they be recognized? How do the expectations/standards others set for us compare to those we set for ourselves? How do they compare to those that are set for others? In what ways do your race and/or gender contribute to barriers/challenges you face? How does the media contribute to misconceptions about who and what we are? What other outside factors impact how we are perceived by others? How do we work to reclaim and re-frame that narrative? Some scholars argue that Black Girls are in a crisis? Do you agree? Why or why not? How can the spaces in which we exist be made safer for us? What ideas do you have about how we can create them? Through these specific questions, we look forward to highlighting the agency and ingenuity of Black Girls by intentionally making room for them to both address the unique challenges they encounter while also celebrating and honoring their leadership, contributions, and achievements! How long will your presentation be (15, 30, 45, 60, or 90 minutes)? Would you rather present individually or with someone else? If you'd like to present with someone else, who would it be? Would you rather stand in front of and speak to an audience, with little conversation or engagement from them OR would you like to present in a workshop format, with the audience actively participating in the presentation? Are YOU ready to start your journey toward becoming a CrookedRoom Conference Youth presenter?! To learn more about the types of presentations you can do, click HERE (search for the heading, presentation format options). To submit a proposal, click HERE and complete the form. If you’d like to print out a copy of the information included on this page, click HERE for Word and HERE for PDF. If you’d be interested in submitting a video proposal, click HERE to learn how. For questions or to submit a video proposal, e-mail us at crookedroomconf@gmail.com. We are now accepting applications! Check out the video to learn details, then click the link below it to apply (we also encourage you to check out the call for proposals, too)! Ready to Apply?! Click HERE. Can’t watch the video? No worries. Below is a summary of things you should know before appying. What’s the purpose of the YPWS? Going forward, The CrookedRoom Conference is building intentionality around our mission to hold and create space for the voices of Black Girls (cis, queer, and trans) to be heard. In addition to creating a unique call for proposals that speaks more to the experiences of our girls, we’re also introducing a unique opportunity to assist our future CRC leaders in building their conference presentations with the help of community activists and the CrookedRoom Conference ambassadors. This 8 week-long workshop series will inspire the passions and creativity of our young change makers and allow them to walk away with resources and thoroughly investigated contributions to conversations of social justice in their respective communities, and the CRC community at-large. How do I know if I qualify to present? 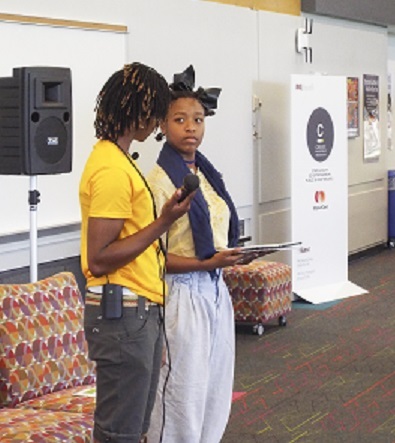 To present at the conference and/or participate in the workshop series, you must identify as a cisgender, queer, and/or transgender Black Girl who is between the ages of 12-18. Fill out the online application (Google Form). Be prepared to provide an adult contact and briefly write about something you’re passionate about. If you are more comfortable submitting a video, feel free to create and send it to crookedroomconf@gmail.com. However, you must respond to each question that’s included on the written application in the video. The application deadline is January 4, 2019 by 11:59pm and notifications will be sent to applicants on or by Monday January 7th. It’s expected that participants will make, at minimum, 6/8 (roughly 80%) of the meetings. After two absences, participants will be dismissed from the series. Can I still submit a proposal, even if I don’t attend the workshop series? Absolutely! However, participants who successfully complete the workshop series will automatically be granted a presentation slot at the conference. Whereas, those who do not will go through the formal selection process. Because our capacity is limited, we will only be able to take 10 participants for the pilot series. However, we do hope to expand and offer this workshop more often, to more Girls. Location: This information will be shared with those who are invited to participate in the workshop.